11 AM departure Monday 19 August from Bellevue, Idaho and a good-bye to the Beaver Creek Fire and related smoke-filled air. My heart goes out to all that are still under evacuation orders. In the past, I have been evacuated from my home on 3 separate occasions – and the experience is harrowing. It never got easier – if only just a bit more organized. Local authorities have simplified it even more = 5 Ps. People. Pets. Paperwork. Pictures. Prescriptions. 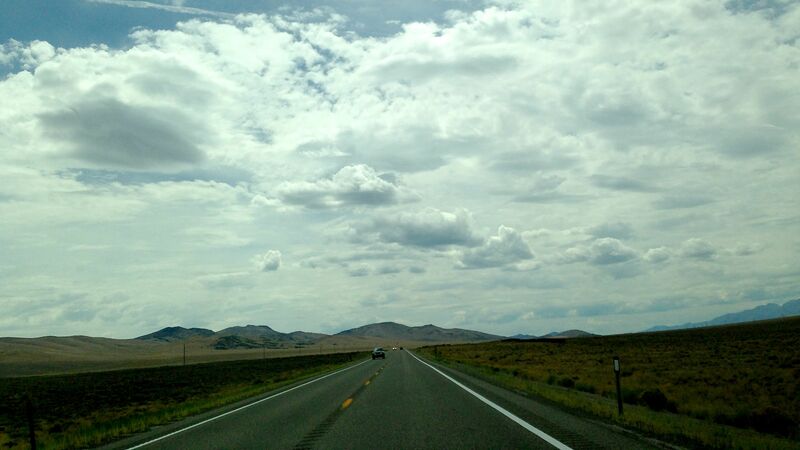 Mom and I decided on a reverse route through northern/western Nevada – routes we had taken north from Bishop that are two lane roads marked by open spaces, sparse traffic and mining concerns or hay/alfalfa farming. Gratefully, we leave the grey-inversion layer of choking burnt forest residue behind us, although the climate pattern continues for over a hundred miles. Remnants of the fire outside of Boise drift from the west. Day’s destination: Battle Mountain, “a land rich in history and adventure. Western Shoshone Native Americans, Basque sheepherders, cattle ranchers and of course, generations of miners, have all called this country their home. I’d forgotten about the time change, and we find ourselves in Battle Mountain an hour earlier than expected. We drive around the city which has a park, schools and mostly non-descript housing. The motel is clean- if not fancy – frequented mostly by minors and geologists who work in the local industry. Their trucks – as well as their bags – are covered with thick layers of dust and mud. Dinner is simple. The Super 8 is right next door to a MacDonalds. Our first (and only and last) fast-food meal of the trip. We both order grilled chicken wraps – simple and not greasy. Buster gets a 1/4 pounder and eats is down with gusto. We tuck in early. Tomorrow night we’ll be back in Bishop.